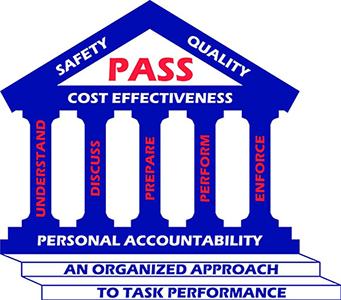 PASS is an internally developed program designed to create an organized approach toward task performance. PASS presents to every employee the Company’s vision, mission, goals, values and a stepwise approach to ensuring each task is performed accordingly. I understand the Safety, Quality, and Cost Effectiveness measures this task requires. I have discussed all Safety, Quality, and Cost Effectiveness measures about this task with everyone involved. I am prepared to perform this task Safely with high Quality, Cost Effectively. I will perform this task to the highest level of Safety, Quality, and Cost Effectiveness. I will enforce all Safety, Quality and Cost Effective measures while performing this task and stop work when necessary. Every Spectra employee carries a PASS card at all times. Ask us for our PASS card.